A mandate of the WJO is to make direct and meaningful connections with many eager young jazz students, driving their passion for music by giving them valuable tools, skills and inspiration to help them succeed in jazz band and beyond. The WJO Education Program includes inviting school and community ensembles to play before WJO concerts. ​If you would like your school or community jazz band to perform before a WJO season concert please contact Richard Gillis at ad@winnipegjazzorchestra.com. The performing students receive complimentary tickets to see the show. We are also pleased to offer the students’ parents discounted tickets to the show. ​Discounted tickets for parents of pre-concert performers have to be purchased at least 24 hours before the performance - not available at the door. ​If you would like to support these students and their school or community jazz bands please contact Richard Gillis at ad@winnipegjazzorchestra.com. We supply from 18 to 35 complimentary tickets to various student groups for each performance. 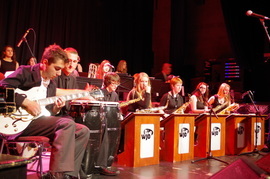 We also provide educational opportunities through jazz band workshops, school concerts, and three honour jazz bands. We greatly appreciate the support of the community-minded organizations and individuals who provide the means to keep these programs going.